Offering the best combination of size, comfort and performance, the 22V is the most popular Tige ever. 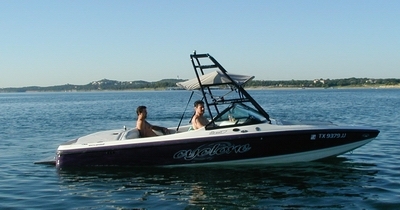 It is also a premier wakeboarding boat used by many TeamTige pro riders. The Tige 22V includes a boatload of family-oriented creature comforts and multi-sport versatility. Relax in the lush wraparound seating sculpted from triple-density high-grade foam. The higher freeboard and deep bow keeps kids and adults safe and dry even in big water. The spacious bow area features comfortable contoured backrests that lift for easy access to under-dash storage areas. Rear gull wing storage areas in the rear are convenient and cavernous. Seats up to 8 people.